Often when I am in the role of a parent, teacher or coach I find myself planting seeds and wondering if they will take root. Krista and I provided a professional development opportunity focused on conferencing with students that are not yet reading conventionally. The audience was a group of primary teachers in grades K-2. Using the work in I Am Reading, by Matt Glover and Kathi Collins we shared their definition of reading and our experiences with young students. 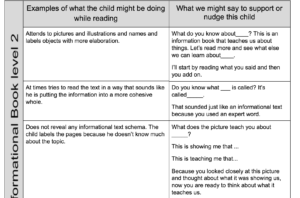 Reading is an interaction with a text during which the reader uses a variety of resources within the text (words, pictures, graphic elements, etc)and within themselves (schema, skills, strategies) to make meaning. In the beginning, we showed interviews with a number of Kindergarten students asking them what is reading and if they were readers. 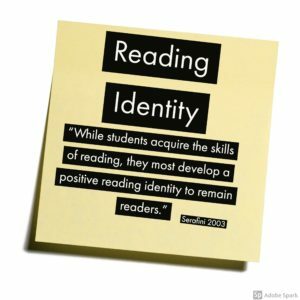 Unfortunately, many of the students did not see themselves as readers. Demonstrating through videos with students and using a traditional conferencing structure we were able to name the reading behaviors that were visible while reading with students. Then we were able to show how to transfer these observations into levels of sophistication, of the student’s reading work. Next, we presented how to nudge a student forward by using a variety of teacher prompts. (See examples of prompts that were used, adapted from Matt Glover and Kathi Collins, I Am Reading.) It was amazing the transformation in the students after just conferencing once with the Kindergarteners. How their view of themselves changed. They began to identify themselves as READERS! The workshop ended with thoughtful questions but with the uncertainty will the teachers find this approach used to work with their students. The following week I happened to be in the staff lounge of one of the elementary buildings and saw a Kindergarten teacher perusing through a box of informational books. The teacher mentioned she had been using higher level texts (not just Level A books) with her students and she was looking for additional books that might interest her students. She continued to share how she had been using the teacher prompts during conferencing and how she noticed her readers moving forward in their reading process. Those seeds had taken root! If I had not happened to walk in at that particular time I would not have realized how helpful these strategies were for this teacher and her students. As a literacy coach, I often feel I am unsure if I am making a difference. Now I realize that sometimes we must plant the seeds, return with a little water, spread some sunshine and have faith. Thanks for these ideas. As new books are published I forget ones that are solid resources. I’m going to go back and give this another look. prompts shared out with teams! As I walked through the halls last week, I found myself hearing something that I needed to address. A teacher telling her students that they weren’t readers. Shocked I stopped in and joined the conversation making sure to point out that we are all readers! A reader looks at pictures, finds snap words, and even sits with a friend to talk about the story. I reminded the group that even if we don’t know all of the words we are still readers and that we will learn them in time.